i started working on organizing and printing camera manuals for my just-acquired (for a measly $26) Zenit TTL camera (oh yes, its russian camera #5) an hour or two before midnight. count about four hours past that, and i’m steel geeking on. better consider this therapy from the crap i get at work. to-do today: practice SLR skills, despite my idiocy. use the light meter (Leningrad 7), since the built-in meter of this russian behemoth seems temperamental. at least i dont guesstimate focus anymore (yes, i’m referring to my smena’s). 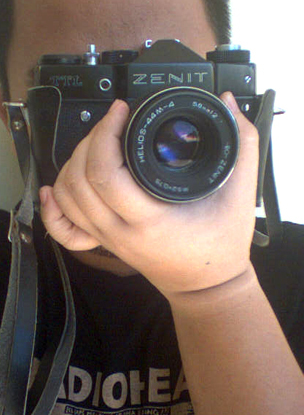 I got 5 Zenits and 2 Zorki’s. and Zenit lost to a Spotmatic given to me. brighter viewfinder wins! Next Next post: hi mommy! hi daddy!